Double loops mean locking AND sealing: just one seal number controls both functions simultaneously. Tamper-evident intelligent design in a cost-eﬀective lightweight package. The Cable Sealock protects against covert attacks, while still exceeding C-TPAT standards for High Security (H) seals. All in 1 compact device. ENFORCER® Cable Sealock is C-TPAT compliant. 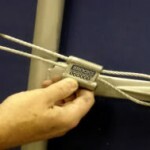 While holding the seal with the decoration facing out, thread the cable through the bottom of the locking hasp. 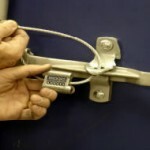 Seal the locking hasp by threading the cable through hasp, pulling about 4″ of cable through the seal body. 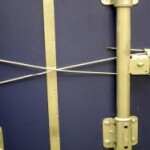 Thread the cable around the inner keeper bars to create a figure-eight. 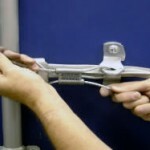 Lock the cable-seal by inserting the free end Of the cable through the bottom of the seal body. Pull both ends of the cable tightly to eliminate all slack. A Cable Sealock properly sealed.